Plants have a lot of requirements for proper and optimal growth. One such factor that affects the growth of plants is the moisture level. Some plants need high moisture levels and thus require high water levels. Plants like orchids and bonsai require an increased level of moisture to help with the growth of the plants whereas plants like cactus have a minimum requirement for the moisture to grow. Those who do gardening know how difficult is it t determine what level of water will be suitable for the plants. It helps all the people out there to understand how their plant is doing concerning moisture levels; there are moisture meters available in the market. These moisture meters indicate the level of moisture in the soil near the roots within minutes. Many meters have a range of moisture given on the meter that can help in knowing if the plant is dry, normal or wet. There are many options available today in the market for moisture meters, but I curated the best and the affordable options for all our wonderful readers. This list contains all the top-rated products that have received positive reviews from all its customers. 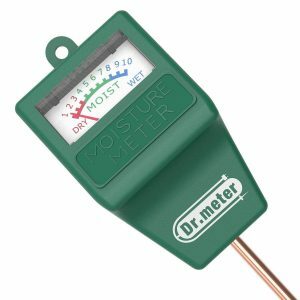 Dr.meter is the top-rated and the best seller in moisture meters available in the market. It can be used for measuring the levels of moisture levels in gardens, lawns, etc. This meter can be used to check if the plants are doing well or are dry or wet. The meter has an eight-inch long stem that penetrates the soil and gives an accurate reading for the moisture level of it. Also, it should be kept in mind that the meter should be used for testing the moisture levels of soil and not the water levels. 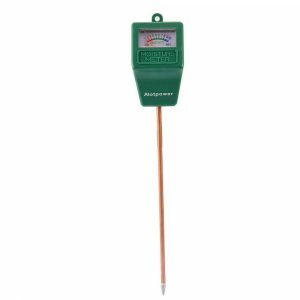 The soil meter has the color codes system for showing the readings that have colors like red, green and blue to indicate the moisture level. There are no batteries or electricity needed it can be just directly plugged in to get the readings. The moisture meter is compact and portable so that it can be used for both indoor and outdoor use. The meter also comes with an 18 months warranty and also has a 24×7 customer service to help you solve the queries with the moisture meter. It has easy to reads moisture levels including ten scales. 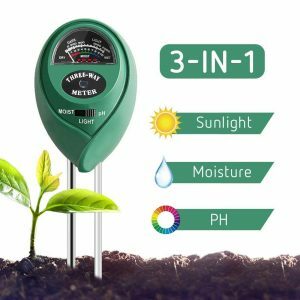 Vivosun plant moisture meter is a 3-in-one soil meter as it can be used to measure the three essential factors for plants: pH, light, and moisture. This meter helps to know the conditions of plants and if it is getting sufficient water and light for the optimal growth. The range for pH is from 3.5 (acidic) to 8 (basic), and the range of light is from 0-2000 ( low light to intense light). The meter comes with a 12-month warranty. The moisture meter is designed so that it can be used to measure the moisture in the range of 1-10 to know if the plants are getting adequate water. It is durable and effortless to use. There are no batteries required to operate this meter; it can be plugged in and used efficiently to know the levels of moisture. The meter takes just 10 minutes to give the readings for the pH, light, and moisture in the dial. The meter is portable and has a compact design that can be used for indoors as well as outdoors. 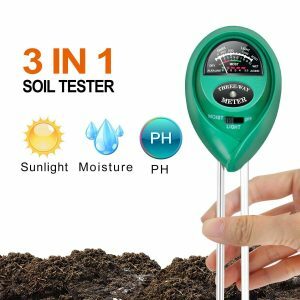 This soil testing tool is efficient in giving information about the levels of moisture in the soil, light available to the plants and pH of the land. It is imperative to know that the soil is well suited for the plants to grow and this kit helps in analyzing all these factors efficiently. It should be kept in mind that this meter shouldn’t be used in liquids as it is just meant for measuring the levels of moisture and not water. The meter measures the moisture content of the soil to help in deciding when to water plants. It also helps in knowing if the plant is getting adequate light. There are no batteries or solar power needed to use this meter. The meter has a unique design which is light in weight and portable. 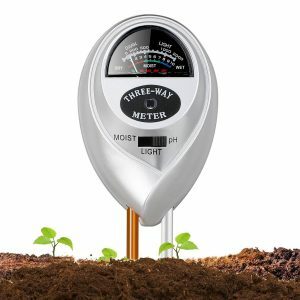 It is easy to carry this meter for outdoor use and is also an ideal soil test toolkit for home plants, lawns, gardens, etc. The meter has a one year warranty from the date of purchase that covers all the quality related issues with a refund or replacement option. 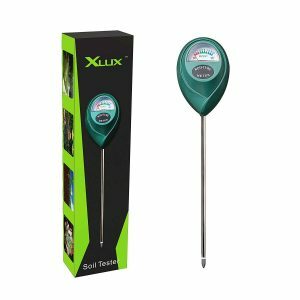 Xlux soil moisture sensor meter is one of the best options in the affordable range for moisture meters. The meters are user-friendly and help in knowing if the plants are getting adequate moisture hence assisting in improving the condition of your plants. To understand the optimal levels of humidity needed for the plants there is a description given on the backside of the package. It promotes healthy plants and prevents over/under water plants. However, the meter shouldn’t be used on the soil having too many hard stones. The probe should be cleaned before and after its use. The meter comes with an 18 month warranty period from the date of purchase including all the quality related issues with refund or replacement. The meter has a large dial including ten scales that gives precise and accurate readings. A battery does not operate it as it is supposed to be just inserted directly into the soil such that it is 3-4 inches deep in the soil. This meter is an ideal tool for gardening in indoors as well as outdoors. The meter also has a color-coded reading system that makes the entire process of knowing the moisture levels of soil. Alotpower soil moisture meter is a premium quality moisture sensor meter that has gotten a lot of acclamation from its customers. It helps in knowing if the soil has sufficient moisture to support the plant’s growth or not. Due to its design, it can be carried to places and is helpful in checking the levels of moisture in lawns, gardens, etc. There are specific cautions of this meter such as it shouldn’t be kept in the soil for a long time, the meter should be kept away from the children and fire, it shouldn’t be used on a tough or rigid surface. The meter is very easy to use. It just needs to be plugged in and get the reading. The probe should be cleaned before every use to get the accurate reading. The meter is scientifically accurate as it measures the levels of moisture accurately and helps in maintaining healthy plants. The meter is suitable for both indoor and outdoor use. There are no batteries required for using this soil moisture meter. The meter is to be directly inserted into the soil to get the reading. This soil moisture meter is designed explicitly for knowing the levels of soil moisture, sunlight available to the plants and pH value of the soil. It has a premium double-needle design that enhances the speed and accuracy of detecting and analyzing the factors. The meter is helpful in knowing if all the elements are in range for the optimal growth of the plants. The meter is super easy to set up and read the necessary information to know if the soil is healthy enough for your plants. There are no batteries required for this meter. You need to toggle the switch to moisture/pH/light position. It comes with a 12-month risk-free warranty. The probe should be inserted into the soil for about 2-4 inches. The meter should be kept in the soil for at least 10 minutes before reading for the best result. 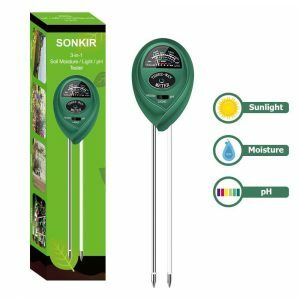 The sonkir soil meter is a 3-in-1 meter as it can be used to test soil moisture, pH and the sunlight levels of plants. It has a scientific approach for measuring the levels which help in controlling every detail and also track all the changes about the plants. If the plant is dehydrated, then the soil pointer will not swing that means the plant needs water. The meter also comes with a 12-month warranty that is hassle-free money back or replacement guarantee. The meter has a premium double-needle detection technology that enhances the speed of detection and gives accurate readings for all the parameters. It has a toggle switch to test moisture, pH, sunlight that you would like to measure. The soil pointer gives the accurate readings for the levels of all the mentioned parameters within few minutes. This meter can be used for indoor and outdoor use as it is lightweight, compact and easy to carry around. So these were the options for moisture meters that are readily available online. I prefer the meters that can be used to measure other parameters such as light and pH. The soil should be suitable for the growth of plants. If the soil is more acidic or basic then required, then it creates problems in the growth of the plants. Same is the matter with light. Plants need adequate sunlight for the process of growth and photosynthesis. I hope this article helps you in deciding upon the best-suited moisture meter for you from the list of options given. 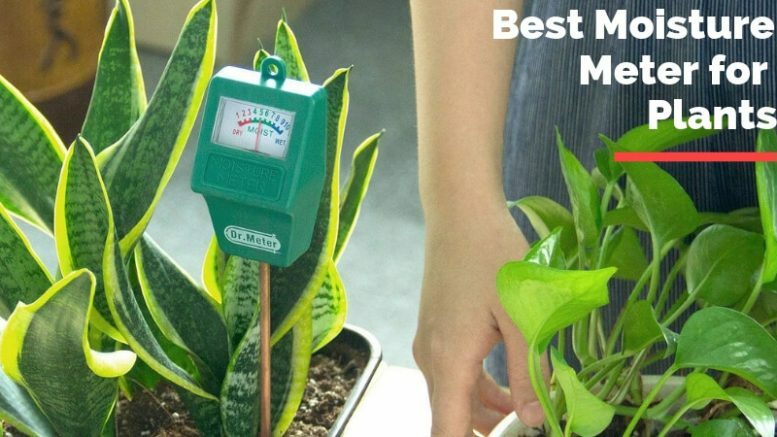 Be the first to comment on "Best Moisture Meter for Plants – Check Plant Moisture Easily (April 2019)"